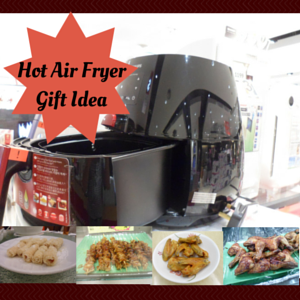 Here is a healthy digital home hot air fryer for low fat meals that would make a good housewarming gift for those who love to cook fried food or those on a low fat diet. The Philips digital hot air fryer comes with a cooking capacity of 1.8 kg. With a 60 min timer control and a temperature adjustment button of up to 390 degrees Fahrenheit, you can fry, roast, bake and grill in it. The entire cooking process is done inside the enclosed airfryer with no messy counter top or floor to clean up. Deep fry using hot air and at the most, only a tablespoon of oil, the Philips hot air cooker makes use of Rapid Air Technology to get its oil-free result. Excess fat from inside the meat itself is also drained out during the cooking process. The Philips air fryer measures 14.5″ wide x 14″ long/deep x 14.5″ high. With an easy to use digital touch screen interface and dishwasher safe removable cooking parts, this hot air fryer is suitable even for teenagers. Included is a double layer rack that gives you the option to have another layer of cooking surface. This increases the amount of food you can air fry at one go. You also have the options of buying extra Philips airfryer accessories for even more cooking options. The main benefit of the air fryer would be its low fat cooking feature. The digital home hot air fryer for low fat meals would certainly appeal to those new home owners who love fried food but on a reduced fat diet. It is also an awesome practical housewarming gift for those who are shifting to apartments as the hot air multi cooker can also be used for baking, roasting and grilling besides air frying.